This is the bigger specie of Treefrog in Canada even if they only grow to a lenght of about 3 to 6 cm. In fact, the gray Treefrog are indeed two species of treefrogs that are very similar in inhabit the same environment, have same behavioral habits and feed on the same preys. The only external difference between the 2 species are their calls. Besides that they can be distinguished by microscopic exams of their blood cells. 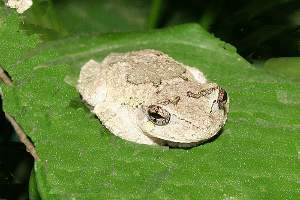 In Canada Gray treefrogs, Hyla versicolor ranges from southern Quebec, southern, central and northwestern Ontario, southeastern and central Manitoba. Hyla chrysoscelis occurs in south central Manitoba and south through the United States, including Lake Michigan. Adult have a warty looking skin and has their name indicate, they are often display gray patern on the back and legs even if the gray treefrogs can adapt their camouflage and change color to a bright green to match their environment. They have a light coloured belly and have white rectangles below the eye as well as a bright yellow streak with dark mottling on the underside of the hind legs. Junevile gray treefrogs have a brilliant green colour. Males specimens can be distinguished by their dark grey throats while the females have white throats. The tadpoles are olive green with a red tail and produce toxic skin secretions. Has other treefrogs, the gray treefrog has large adhesive pads at the ends of its toes that allow them to climb on trees, rocks and other vertical structures. These treefrogs are great climbers and are often found very high in trees. They have nocturnal habits and usually stays in the vegetation during the day. The gray treefrog usually hibernates on the ground land below rocks or in small mammal burrows, but they can also found a hole in a tree to spend the winter. These treefrogs Individuals can endure really cold temperatures because there blood contain high levels of glycerol which acts as a natural antifreeze. The gray tree frogs mating season occurs between mid-June and mid-July and is one of the rare moments where male specimens can be seen in the water looking for a good calling spot to call their charms to the females. When a female approaches in response to the male’s call, she either touches him with her nose or leaps on him. The male responds instantly by moving himself behind the female and grasping her with his front legs. They mate for several hours then the female goes down to the water to deposit her eggs with the male usually still on her. Up to 2500 eggs are then attached to plants or rocks. Gray treefrogs eggs are grey on top and white below and take 2 to 5 days to hatch letting tadpoles that will take almost to month before metamorphosing into froglets. Gray treefrogs inhabit wetlands with submerge vegetation and also enjoy staying close to human habitation since the light attracks preys that they can catch easily. They feed on insect and bugs while their colour allows them to hide from most predator. One common predator for juvenile gray treefrog can be preys to the dragonflies larvaes..